With the creation of more and more outdoor wedding venues it’s no surprise that an increasing number of couples are thinking ‘festival style’. And with plenty of stylists, venues and prop hire outfits promoting boho chic, it’s a tempting prospect, particularly for couples who pride themselves on being style savvy. So, you’ve booked the wooded glade, signed up a band, reserved the artisan ale and are busy working on rustic decorative touches. Food – well a couple of food trucks should do it right? 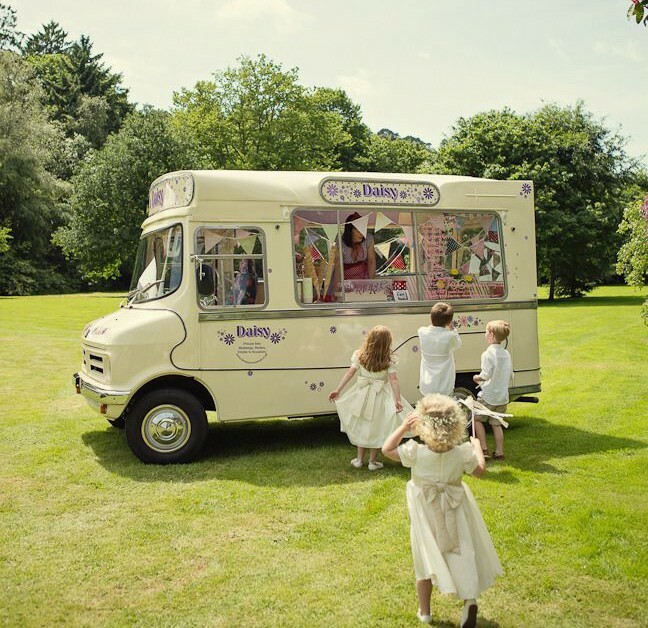 Here’s our 10 reasons why food trucks don’t work for weddings! A food truck will only attend for a specific time slot – yes it’s informal, but guests could easily miss the boat! Food will be probably be served in disposable containers with throwaway cutlery. The potential environmental impact aside, consider if that will really work for all your guests? Don’t forget about elderly relatives. It’s not that we’re anti food truck! As ‘conventional’ caterers perhaps you might say we’re biased. We’d prefer to say we’re simply speaking from experience! “Wedding catering is about so much more than just the food on the plate,” explained Expresso’s Roland Schreiber. “With over 30 years’ experience in high quality hospitality we’re able to offer clients practical advice and guidance to ensure their wedding party is a success in the eyes of all the guests. “Festival style weddings can work really well as long as the planning has been realistic, taking into account things like the unpredictable weather and the age spread of guests. For instance, not everyone will be comfortable standing in line for 20 minutes for something in a cardboard tray that they have to eat off their knee while sitting on a straw bale in the blazing sun. Roland said that Norfolk had a great selection of food trucks, many targeting the wedding market. A highly recommended outside caterer, Expresso specialises in wedding catering across Norfolk and North Suffolk. To discuss your plans for 2019, 2020 or 2021 get in touch now!